For some jobs, only an ultra high quality, long-lasting 10000 KG round sling will do. Well that’s where Rope Services Direct comes in. Our orange coloured round slings offer excellent protection to the more delicate load, there are no seams and no rough edges; the tube structure also protects the load bearing core of polyester yarn hank. 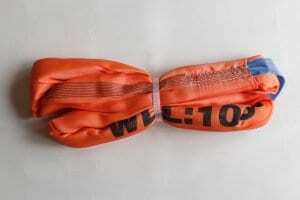 We supply top quality, UK manufactured polyester webbed round lifting slings for our customers to choose from. Constructed to elevate and transfer anything up to 10000 kg in weight, these very substantial lifting slings are an attractive option instead of wire rope and lifting chains. Each round sling from RSD always meets British Standards Institute as well as CE standards. Used primarily in marine and motor environments, our fantastic slings are ideal for a range of uses in farming, sports, mechanical and engineering too. Why not as you are here, view our selection of round slings and fibre rope slings, we almost certainly will have one to meet your requirements. Our round slings are great for using in basket hitches and choke hitches as well as for vertical lifting, remember to pay close attention to the load & hitch type charts and lifting angles of the sling, all of which can affect the safe working load; refer to some slinging information here. Note: It is extremely dangerous to load a sling with excess weight to the limit it was manufactured to tolerate. Failure of the sling for this reason could result in serious damage or injury. Based at our warehouse in the West Midlands, customer satisfaction is our priority and we offer a large variety of 10000kg round slings from which you can choose. Feel free to order or make enquiries here. For more help before you make your purchase, simply contact our friendly team at 01384 78004. 10000 kg Round Sling Overall rating: 5 out of 5 based on 6 reviews.